PROFESSIONAL QUALITY. 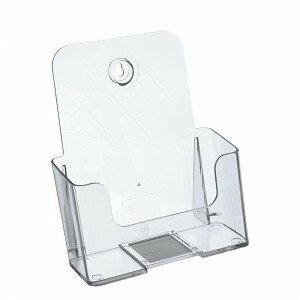 Made of top-quality acrylic, this clear 6 Inch brochure holder features excellent durability and resiliency. It has smooth edges and is transparent. The clear acrylic is the perfect compliment to any brochure to promote advertising. Acrylic is a shatter-resistant material that boasts great strength despite its light weight. Made of top-quality acrylic, this clear 6 Inch brochure holder features excellent durability and resiliency. It has smooth edges and is transparent. The clear acrylic is the perfect compliment to any brochure to promote advertising. Acrylic is a shatter-resistant material that boasts great strength despite its light weight. SELF-STANDING. Self-standing and innovatively designed, the SourceOne 6 Inch Wide Brochure Holder is the ideal for holding images, brochures, and advertising pamphlets. It displays pictures and 6 inch magazines efficiently, and stands on its own without difficulty thanks to its solid-back base. MONEY BACK GUARANTEE. SourceOne products are always in stock, and we offer a money-back guarantee. Our fast shipping ensures that your order arrives fast, safe, and in top-notch condition. That means no damage, no scratches-the best condition possible. If you're not satisfied with your order, we promise to return your hard-earned money. Customers like you are our number-one priority, and if you're happy, it means we've done our job. DIFFERENT TYPES. This package contains a full case of 48 6Inch Wide Brochure Holder, SourceOne offers many different sizes and colors, making us you're number 1 choice for all advertising needs. If you have any questions about this product by SourceOne, contact us by completing and submitting the form below. If you are looking for a specif part number, please include it with your message.